2018 has been dominated by the Gutenberg editor – WordPress’ attempt to overhaul the user’s writing experience. This (of course) brings change to the platform. Consequently, developers are just beginning to embark on an ‘arms race’ to see who will get the upper hand with early adopters. This may seem like an inconsequential battle to partake in. To many, however, being first means the entire market is available. This means there’s more business to win, and a greater cash supply to tap into. For a lot of WordPress developers, those reasons are plenty of motivation. This piece will briefly look at the Gutenberg project as a whole. Then we’ll discuss why many feel the need to be a pioneer in the field. Finally, we’ll touch on what you can expect from WordPress developers in the near future, and sum up how the theme and plugin landscape might be affected. Let’s take a look! In case you’ve been living under a rock, Gutenberg is WordPress’ newest addition. 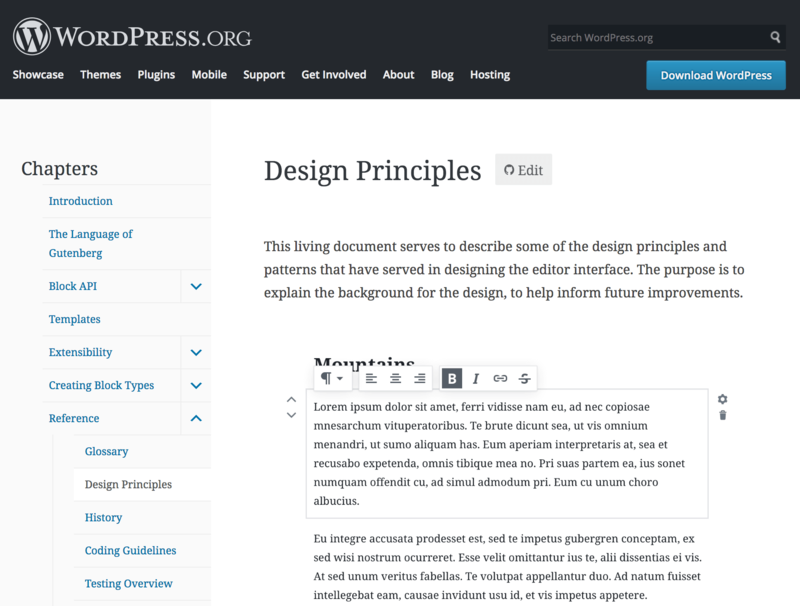 It’s currently in beta but will be merged into core in WordPress 5.0. Gutenberg is a replacement for the current TinyMCE editor and adds several new methods for creating content and layouts. However, the response to Gutenberg has been less than stellar, especially upon its initial release. At the same time, a number of projects have sprung up to help developers try and get the best out of the new editor, and port their existing solutions over. For example, Daniel Bachhuber has become a prominent leader in providing helpful tools, such as the Gutenberg Plugin Compatibility Database and Gutenberg Migration Guide. These resources will likely increase in number as the overall Gutenberg project gathers speed. Of course, many developers are looking at the unfolding situation and thinking one thing – How can we make money out of Gutenberg? It gives developers access to the largest possible market. It goes without saying that being first on the scene gives a developer practically no competition when it comes to carving out a market share. This advantage will be fleeting, but even so, the jump they have on their rivals can get them ahead. There’s more development time. Over the long-term, developers will have more experience working with a particular solution when compared to their competitors. This can pay off with a quicker ‘evolution’ of their products down the line. Being the first results in more attention. Of course, there’s also recognition to be had by being a pioneer. At the very least, developers who are first on the scene will get a decent amount of publicity. After all, there will be almost no one else to feature in those initial days. You may also hear this benefit called the ‘first-mover advantage’. For those developers willing to work with first adopters in a pseudo-prototyping phase – i.e. an almost constant beta state while the solution finds its feet – the above benefits apply even more. Our point here is that, for the reasons listed above, many WordPress developers are eager to get a head start with Gutenberg in any way possible. As you might expect, there’s a lot of guesswork involved in predicting how Gutenberg and the WordPress development community will evolve. Fortunately, there’s already been some movement among Gutenberg pioneers. These early initiatives tell us something about where the fledgling roots are likely to shoot up. Given the above, it’s interesting to note that WooCommerce has also released arguably the very first block product for download. The WooCommerce Gutenberg Products Block can be downloaded from the official website and the WordPress Plugin Directory. Of course, this shouldn’t be used on a live site just yet. As a staging site ‘plaything’, however, it’s an exciting turn of events for e-commerce users. As for other Gutenberg-specific solutions, Doc Pop recently rounded up a few plugins that can be found in the Plugin Directory – some offering additional single blocks, and others a collection of related blocks. Even though Gutenberg isn’t yet out of beta, it seems that there are plenty of developers forging ahead and trying to capture the market early. Overall, there obviously isn’t going to be one ‘winner’ when it comes to Gutenberg – especially one we can predict. For example, you could argue that Automattic will ultimately win the race over the long-term. This is mainly because whatever gains the WordPress community makes will benefit them the most monetarily. If Gutenberg does achieve the goals it was designed for – i.e. devouring the competition and winning new users in the process – Automattic will obviously be ecstatic regardless of how their product line fares. The general WordPress developer community also stands to benefit, especially if one of them stumbles across a winning formula early on. Combining a healthy user base known for spending money on premium solutions with a new and exciting product is clearly a tantalizing thought. As such, there will be many developers creating unique products, but also plenty of ‘me too’ solutions. Regardless, if the Gutenberg boom happens, the plugin and theme markets should see a similar revival. With that in mind, Envato and other marketplaces might be the unexpected benefactors of a lot of Gutenberg money. They’re likely to become go-to locations for unique blocks, just as they are for themes, plugins, and assets. Overall, however, the number-one beneficiary of the Gutenberg arms race will be the customer. As we mentioned earlier, competition is healthy in any industry. There’s no doubt that we’re going to see an abundance of unique solutions to the average WordPress user’s problems, at encouraging prices. Gutenberg’s influence is far-reaching, more than you might expect from an editor used to create content. There’s a whole industry remobilizing as we speak in order to adapt to this change, with the potential for significant monetary gain on their minds. As such, there are likely to be a lot of upcoming developments in this area of WordPress. Of course, it will be important to watch WordPress’ developer, Automattic. Since the new editor is their baby, it’s going to be interesting to see how they develop for Gutenberg, and whether it’s monetized in some way. Regardless, it’s likely that the overall winner of all this competition will be the paying customer. In our opinion, that’s beneficial to WordPress’ overall economy. Do you have an insight into who will ‘win’ the Gutenberg arms race? Let us know your thoughts in the comments section below!